This application claims priority under 37 U.S.C. § 119(e) to U.S. Provisional Application Ser. No. 60/482,958, filed Jun. 27, 2003.
wherein the composition is capable of suspending water in a lipophilic fluid, is provided. The term “fabric article treating composition” used herein is intended to mean any lipophilic fluid-containing composition containing cleaning and/or care additives that comes into direct contact with fabric articles to be cleaned. It should be understood that the term “fabric article treating composition” encompasses uses other than cleaning, such as conditioning and sizing. Furthermore, optional cleaning adjuncts such as additional surfactants other than those surfactants described above, bleaches, and the like may be added to the “fabric article treating composition”. That is, cleaning adjuncts may be optionally combined with the lipophilic fluid. These optional cleaning adjuncts are described in more detail hereinbelow. Such cleaning adjuncts may be present in the fabric article treating compositions of the present invention at a level of from about 0.01% to about 10% by weight of the fabric article treating composition. The term “soil” means any undesirable substance on a fabric article that is desired to be removed. By the terms “water-based” or “hydrophilic” soils, it is meant that the soil comprised water at the time it first came in contact with the fabric article, or the soil retains a significant portion of water on the fabric article. Examples of water-based soils include, but are not limited to, beverages, many food soils, water soluble dyes, bodily fluids such as sweat, urine or blood, and outdoor soils such as grass stains and mud. “Solvent compatibility group”, as used herein, means any hydrocarbon, silicone, polyalkylene oxide (ethoxy, propoxy, butoxy, etc. and mixtures) or flurorinated groups. Hydrocarbon groups may be linear, cyclic, branched, saturated or unsaturated straight and branched chain linear aliphatic; saturated and unsaturated cyclic aliphatic, including heterocyclic aliphatic; or mononuclear or polynuclear aromatics, including heterocyclic aromatics. Polyoxyalkylene groups may comprise of one or more or a mixture of alkoxy repeat units. Silicone and fluorinated groups may consist of one or more or a mixture of repeat units. “Functionalized”, as used herein, means the indicated solvent compatibility groups are chemically bonded to the polyol. A “functional unit”, as used herein, means one solvent compatibility group used to functionalize the polyol. “Lipophilic fluid” as used herein means any non-aqueous solvent that meets the Sebum Removal Test described hereinbelow and that at least partially liquid and/or readily flowable (nonviscous) at ambient temperature and pressure. In general, a suitable lipophilic fluid can be fully liquid at ambient temperature and pressure, can be an easily melted solid, e.g., one which becomes liquid at temperatures in the range from about 0° C. to about 60° C., or can comprise a mixture of liquid and vapor phases at ambient temperatures and pressures, e.g., at 25. ° C. and 1 atm. pressure. The Sebum Removal Test described herein is used to identify suitable lipophilic fluids for use in the present invention. The test method uses commercially available Crisco® canola oil, oleic acid (95% pure, available from Sigma Aldrich Co.) and squalene (99% pure, available from J. T. Baker) as model soils for sebum. The test materials should be substantially anhydrous and free from any added adjuncts, or other materials. As a general guideline, perfluorobutylamine (Fluorinert FC43®) on its own (with or without adjuncts) is a reference material that, by definition, is unsuitable as the lipophilic fluid. In such a case, with a syringe, carefully extract a 200 microliter sample from each layer in each vial. The syringe-extracted layer samples are placed in GC autosampler vials and subjected to conventional GC analysis after determining the retention time of calibration samples of each of the three models soils and the fluid being tested. If more than 1% of the test fluid by GC, preferably more, is found to be present in any one of the layers which consists of the oleic acid, canola oil or squalene layer, then the test fluid is also qualified for use as a lipophilic fluid. If needed, the method can be further calibrated using heptacosafluorotributylamine, i.e., Fluorinert FC-43 (fail) and cyclopentasiloxane (pass). Carrier Gas: Hydrogen; Column Head Pressure: 9 psi; Flows: Column Flow@˜1.5 ml/min. ; Split Vent@˜250-500 ml/min. ; Septum Purge@1 ml/min. ; Injection: HP 7673 Autosampler, 10 ul syringe, 1 ul injection; Injector Temperature: 350° C.; Detector Temperature: 380° C.; Oven Temperature Program: initial 60° C., hold 1 min. ; rate 25° C./min. ; final 380° C. hold 30 min. Preferred lipophilic fluids suitable for use herein can further be qualified for use on the basis of having an excellent garment care profile. Garment care profile testing is well known in the art and involves testing a fluid to be qualified using a wide range of garment or fabric article components, including fabrics, threads and elastics used in seams, etc., and a range of buttons. Preferred lipophilic fluids for use herein have an excellent garment care profile; for example, they have a good shrinkage or fabric puckering profile and do not appreciably damage plastic buttons. For purposes of garment care testing or other qualification, e.g., flammability, a lipophilic fluid for use in the lipophilic fluid can be present in a mixture, e.g., with water, at approximately the ratio to be used in the final lipophilic fluid which will come into contact with fabric articles. Certain materials, which remove sebum, qualify for use as lipophilic fluids; for example, ethyl lactates can be quite objectionable in their tendency to dissolve buttons, and if such a material is to be used in the lipophilic fluid, it will be formulated with water and/or other solvents such that the overall mix is not substantially damaging to buttons. Other lipophilic fluids, decamethyl-cyclopentasiloxane for example, meet the garment care requirements commendably. Some suitable lipophilic fluids may be found in granted U.S. Pat. Nos. 5,865,852; 5,942,007; 6,042,617; 6,042,618; 6,056,789; 6,059,845; and 6,063,135. Nonlimiting examples of suitable lipophilic fluid materials include siloxanes, other silicones, hydrocarbons, glycol ethers, glycerine derivatives such as glycerine ethers, perfluorinated amines, perfluorinated and hydrofluoroether solvents, low-volatility nonfluorinated organic solvents, diol solvents, other environmentally-friendly solvents and mixtures thereof. “Siloxane” as used herein means silicone fluids which are non-polar and insoluble in water or lower alcohols. Linear siloxanes (see for example U.S. Pat. Nos. 5,443,747, and 5,977,040) and cyclic siloxanes are useful herein, including the cyclic siloxanes chosen from octamethyl-cyclotetrasiloxane (tetramer), dodecamethyl-cyclohexasiloxane (hexamer), and preferably decamethyl-cyclopentasiloxane (pentamer, commonly referred to as “D5”). A preferred siloxane comprises more than about 50% cyclic siloxane pentamer, in another embodiment more than about 75% cyclic siloxane pentamer, in yet another embodiment at least about 90% of the cyclic siloxane pentamer. Also preferred for use herein are siloxanes which are a mixture of cyclic siloxanes having at least about 90% (preferably at least about 95%) pentamer and less than about 10% (preferably less than about 5%) tetramer and/or hexamer. Mixtures of lipophilic fluid are also suitable, provided that the requirements of the Lipophilic Fluid Test, as described below, are met. The lipophilic fluid can include any fraction of dry-cleaning solvents, especially newer types including fluorinated solvents, or perfluorinated amines. Some perfluorinated amines such as perfluorotributylamines, while unsuitable for use as lipophilic fluid, may be present as one of many possible adjuncts present in the lipophilic fluid-containing composition. Nonlimiting examples of low volatility nonfluorinated organic solvents include for example OLEAN® and other polyol esters, or certain relatively nonvolatile biodegradable mid-chain branched petroleum fractions. Nonlimiting examples of glycol ethers include propylene glycol methyl ether, propylene glycol n-propyl ether, propylene glycol t-butyl ether, propylene glycol n-butyl ether, dipropylene glycol methyl ether, dipropylene glycol n-propyl ether, dipropylene glycol t-butyl ether, dipropylene glycol n-butyl ether, tripropylene glycol methyl ether, tripropylene glycol n-propyl ether, tripropylene glycol t-butyl ether, tripropylene glycol n-butyl ether. Nonlimiting examples of other silicone solvents, in addition to the siloxanes, are well known in the literature, see, for example, Kirk Othmer's Encyclopedia of Chemical Technology, and are available from a number of commercial sources, including GE Silicones, Toshiba Silicone, Bayer, and Dow Corning. For example, one suitable silicone solvent is SF-1528 available from GE Silicones. wherein R1, R2 and R3 are each independently selected from: Hydrogen; branched or linear, substituted or unsubstituted C1-C30 alkyl, C2-C30 alkenyl, C1-C30 alkoxycarbonyl, C3-C30 alkyleneoxyalkyl, C1-C30 acyloxy, C7-C30 alkylenearyl; C4-C30 cycloalkyl; C6-C30 aryl; and mixtures thereof. Two or more of R1, R2 and R3 together can form a C3-C8 aromatic or non-aromatic, heterocyclic or non-heterocyclic ring. Nonlimiting examples of suitable glycerine derivative solvents, further include 2,3-bis(1,1-dimethylethoxy)-1-propanol; 2,3-dimethoxy-1-propanol; 3-methoxy-2-cyclopentoxy-1-propanol; 3-methoxy-1-cyclopentoxy-2-propanol; carbonic acid (2-hydroxy-1-methoxymethyl)ethyl ester methyl ester; glycerol carbonate and mixtures thereof. Nonlimiting examples of other environmentally-friendly solvents include lipophilic fluids that have an ozone reactivity of from about 0 to about 0.31, lipophilic fluids that have a vapor pressure of from about 0 to about 0.1 mm Hg, and/or lipophilic fluids that have a vapor pressure of greater than 0.1 mm Hg, but have an ozone reactivity of from about 0 to about 0.31. Nonlimiting examples of such lipophilic fluids that have not previously been described above include carbonate solvents (i.e., methyl carbonates, ethyl carbonates, ethylene carbonates, propylene carbonates, glycerine carbonates) and/or succinate solvents (i.e., dimethyl succinates). The surfactant component, when present in the fabric article treating compositions of the present invention, preferably comprises from about 0.01% to about 20% more preferably from about 0.02% to about 5%, even more preferably from about 0.05% to about 2% by weight of the fabric article treating composition. Another class of materials can include polyol-based surfactants. “Polyol”, as used herein, means any aliphatic or aromatic compound containing at least two free hydroxyl groups. In practicing the processes disclosed herein, the selection of a suitable polyol is simply a matter of choice. For example, suitable polyols may be selected from the following classes: saturated and unsaturated straight and branched chain linear aliphatic; saturated and unsaturated cyclic aliphatic, including heterocyclic aliphatic; or mononuclear or polynuclear aromatics, including heterocyclic aromatics. Carbohydrates and glycols are exemplary polyols. Especially preferred glycols include glycerin. Monosaccharides suitable for use herein include, for example, mannose, galactose, arabinose, xylose, ribose, apiose, rhamnose, psicose, fructose, sorbose, tagitose, ribulose, xylulose, glusose, and erythrulose. 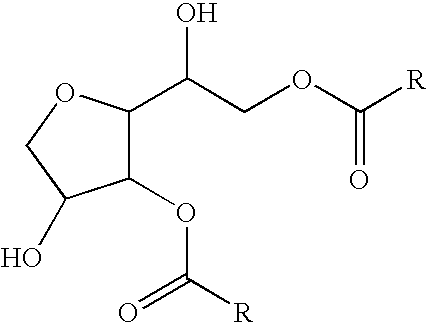 Oligosaccharides suitable for use herein include, for example, maltose, kojibiose, nigerose, cellobiose, lactose, melibiose, gentiobiose, turanose, rutinose, trehalose, sucrose and raffinose. Polysaccharides suitable for use herein include, for example, amylose, glycogen, cellulose, chitin, inulin, agarose, zylans, mannan and galactans. Although sugar alcohols are not carbohydrates in a strict sense, the naturally occurring sugar alcohols are so closely related to the carbohydrates that they are also preferred for use herein. The sugar alcohols most widely distributed in nature and suitable for use herein are sorbitol, erythritol, arabitol, xylitol, threitol, pentaerythritol, mannitol and galactitol. Particular classes of materials suitable for use herein include monosaccharides, disaccharides and sugar alcohols. Other classes of materials include sugar ethers, alkoxylated polyols, such as polyethoxy glycerol, pentaerythritol and other polyols containing amines such as glucosamine. Wherein R are independently selected from H, alkyls, polyoxyalkylenes, siloxanes or flurorinated groups; and at least two hydroxyl groups are present in the polyol moiety, either to terminate one or more R groups, be present within one or more of the R groups or be present from non-complete functionalization of a polyol starting material with an example being sucrose. The alkyl groups may be linear or branched, cyclic or acyclic, saturated or unsaturated, and contain about 1-30 carbons, preferably about 6 to 30 carbons, more preferably about 8 to 18 carbons. Silicone and fluorinated groups may consist of 1-50 repeat units. The method of functionalizing the polyol moiety may be, but not limited to alkylation, esterification, etherification, amidation, amination and other linking chemistries. Thus, the corresponding bridging group B can be alkyl, ester, ether, amido, and amino linking groups. The number and size of the lipophilic moieties L associated with a given polyol group is important for optimized the performance of the surfactant. Not limited in theory, the number and size of the lipophilic moieties L used for a given polyol is important for optimized performance. Without being bounded by theory, too large and/or too many lipophilic moieties L can lead to various unwanted properties such as too high a solubility profile in the solvent, too high a molecular weight leading to molecular weight inefficiency and potentially the materials becoming a solid making solubiliztion in the solvent and formulation difficulty. Too few and/or too small solvent lipophilic moieties Lcan lead to reduced performance of the polyol due to poor solubility in the solvent. The present invention polyol based surfactants may comprise one or more polyalkylene oxide units within the structure. EO/PO/BO and higher materials are alkoxy moieties, preferably selected from ethoxy, propoxy, butoxy and mixed EO/PO, EO/BO. PO/BO, EO/PO/BO groups wherein the number of repeat units (m) may consist of 1-50 units. The alkoxy moieties may) be either a distribution or with an average degree of alkoxylation or it may be a single specific chain with an exact alkoxylation number. Placement of the alkoxy moieties in the stucture may be near the polyol moiety or on the ends on the R units. Placement of the alkoxy moieties in the stucture may be near the polyol moiety or on the ends on the R units. Placement of the alkoxy moieties in the stucture may be near the polyol moiety or on the ends on the R units. 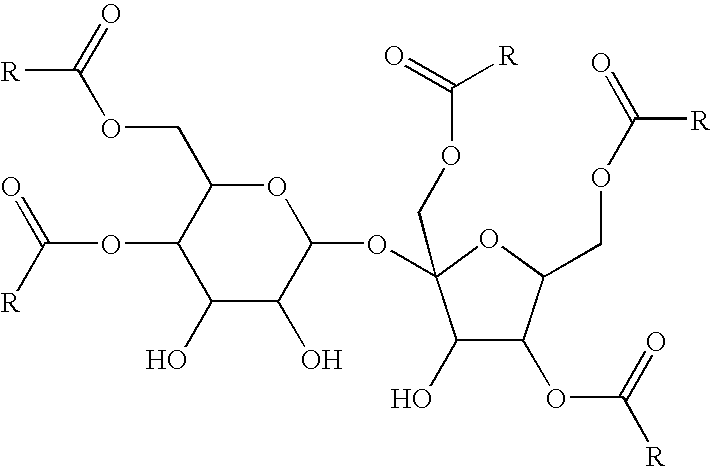 In one embodiment of the present invention, functionalized polyol is derived from a sucrose ester with an average of at least 2 OH groups per molecule with a lipophilic group R derived from a linear, cyclic, branched, unsaturated feedstock based on hydrocarbon or silicone as shown below. Compound 1 is a sucrose ester shown above with the solvent compatibility groups being derived from a oleyl based feedstock such as soybean oil where the degree of esterification as an average of 5. Compound 2 is a sucrose ester shown above with the solvent compatibility groups being derived from a oleyl based feedstock such as soybean oil where the degree of esterification as an average of 6. Compound 3 is a sucrose ester shown above with the solvent compatibility groups being derived from a oleyl based feedstock such as soybean oil where the degree of esterification as an average of 7. 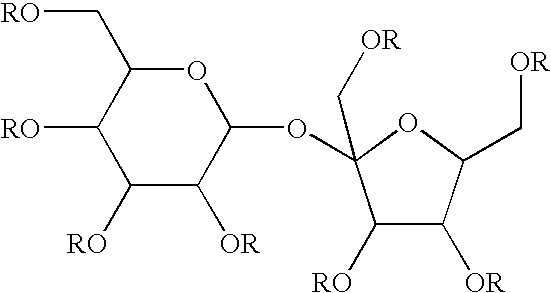 In one embodiment of the present invention, a functionalized polyol is derived from a sucrose ether with an average of at least 2 OH groups per molecule with a lipophilic group R derived from a linear, cyclic, branched, unsaturated feedstock based on hydrocarbon or silicone as shown below. 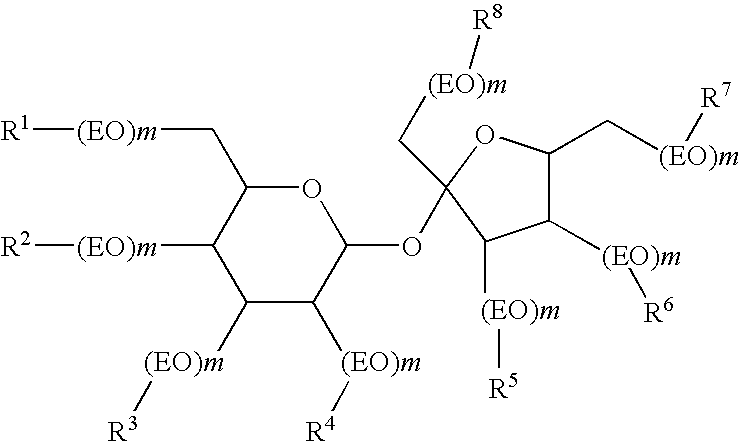 In one embodiment of the present invention, functionalized polyol is derived from a sorbitan ester with an average of at least 2 OH groups per molecule with a lipophilic group R derived from linear, cyclic, branched, unsaturated feedstock based on hydrocarbon or silicone as shown below. The polyol based surfactants of the present invention have R groups which are saturated, unsaturated, linear or branched, cyclic or acyclic hydrocarbons ranging from 6 to 30 total carbons, more preferably from 8 to 18 carbons. The polyol based surfactants are present in the cleaning formulations of the present invention at levels from 0.001% to 20%, more preferably from about 0.01% to 2%. An optional second surfactant can be selected from a class of materials that includes siloxane-based surfactants (siloxane-based materials). The siloxane-based surfactants in this application may be siloxane polymers for other applications. The siloxane-based surfactants typically have a weight average molecular weight from 500 to 20,000. Such materials, derived from poly(dimethylsiloxane), are well known in the art. In the present invention, not all such siloxane-based surfactants are suitable, because they do not provide improved cleaning of soils compared to the level of cleaning provided by the lipophilic fluid itself. Examples of the types of siloxane-based surfactants described herein above may be found in EP-1,043,443A1, EP-1,041,189 and WO-01/34,706 (all to GE Silicones) and U.S. Pat. No. 5,676,705, U.S. Pat. No. 5,683,977, U.S. Pat. No. 5,683,473, and EP-1,092,803A1 (all to Lever Brothers). The optional non-silicone additive (i.e., materials do not contain an Si atom), which preferably comprises a strongly polar and/or hydrogen-bonding head group, further enhances soil removal by the compositions of the present invention. Examples of the strongly polar and/or hydrogen-bonding head group-containing materials include, but are not limited to alcohols, cationic materials such as cationic surfactants, quaternary surfactants, quaternary ammonium salts such as ammonium chlorides (nonlimiting examples of ammonium chlorides are Arquad materials commercially available from Akzo Nobel) and cationic fabric softening actives, nonionic materials such as nonionic surfactants (i.e., alcohol ethoxylates, polyhydroxy fatty acid amides), gemini surfactants, anionic surfactants, zwitterionic surfactants, carboxylic acids, sulfates, sulphonates, phosphates, phosphonates, and nitrogen containing materials. In one embodiment, non-silicone additives comprise nitrogen containing materials chosen from primary, secondary and tertiary amines, diamines, triamines, ethoxylated amines, amine oxides, amides and betaines, a nonlimiting example of a betaines is Schercotaine materials commercially available from Scher Chemicals and mixtures thereof. Compositions according to the present invention may further comprise a polar solvent. Non-limiting examples of polar solvents include: water, alcohols, glycols, polyglycols, ethers, carbonates, dibasic esters, ketones, other oxygenated solvents, and mixutures thereof. Further examples of alcohols include: C1-C126 alcohols, such as propanol, ethanol, isopropyl alcohol, etc., benzyl alcohol, and diols such as 1,2-hexanediol. The Dowanol series by Dow Chemical are examples of glycols and polyglycols useful in the present invention, such as Dowanol TPM, TPnP, DPnB, DPnP, TPnB, PPh, DPM, DPMA, DB, and others. Further examples include propylene glycol, butylene glycol, polybutylene glycol and more hydrophobic glycols. Examples of carbonate solvents are ethylene, propylene and butylene carbonantes such as those available under the Jeffsol tradename. Polar solvents for the present invention can be further identified through their dispersive (δD), polar (δP) and hydrogen bonding (δH) Hansen solubility parameters. Preferred polar solvents or polar solvent mixtures have fractional polar (fP) and fractional hydrogen bonding (fH) values of fP>0.02 and fH>0.10, where fP=δP/(δD+δP+δH) and fH=δH/(δD+δP+δH), more preferably fP>0.05 and fH>0.20, and most preferably fP>0.07 and fH>0.30. Water, when present in the wash fluid fabric article treating compositions of the present invention, may comprise from about 0.001% to about 10%, more preferably from about 0.005% to about 5%, even more preferably from about 0.01% to about 1% by weight of the wash fluid fabric article treating composition. Add the DMSO and sucrose into a 12 Liter reactor and mix well to dissolve the sucrose. Then add the oleyl ester 7.75 and 30 g catalyst. Heat to 100-110° C. React until desired degree of esterification is reached by measuring on SFC (supercritical fluid chromatography). Nitrogen is swept over the reactor. When reaction is completed, cool to ˜65° C. then wash with 10% water and gently mix. Centrifuge at ˜6000 rpm for 5 minutes to remove remaining catalyst, soap and DMSO. Decant off the top liquid layer. Evaporate any remaining DMSO/Water by running material through the 2″ Wipe Film Evaporator (WFE) at 100° C. and ˜0.8 mm Hg. This detergent composition is diluted with D5/0.5% water to 1 wt % concentration in the resulting wash liquor (referred to as “Example 2”). The stain removal or fabric cleaning capability of Example 2 is tested according to ASTM D4265-98 using cotton swatches and artificial stains. A detergent composition is prepared according to Example 2, except that a sucrose ester (compound 1) was added at 15% of the formula partially replacing propylene glycol. This composition is diluted with D5/0.5% water to 1 wt % concentration in the resulting wash liquor. The stain removal or fabric cleaning capability of the composition is tested according to ASTM D4265-98 using cotton swatches and artificial stains. Example 3 shows improved stain removal on grass, US clay and spaghetti sauce compared to Example 2. A detergent composition is prepared according to Example 2, except that the sucrose esters 6.0 and 7.0 (compounds 2 and 3) was added at 15% of the formula partially replacing propylene glycol. This composition is diluted with D5/0.5% water to 1 wt % concentration in the resulting wash liquor. The stain removal or fabric cleaning capability of the composition is tested according to ASTM D4265-98 using cotton swatches and artificial stains. Example 4 shows reduced stain removal on grass, US clay and spaghetti sauce compared to Example 3. 2. The fabric article treating composition according to claim 1, wherein said lipophilic fluid is chosen from siloxanes, other silicones, hydrocarbons, glycol ethers, glycerine derivatives such as glycerine ethers, perfluorinated amines, perfluorinated and hydrofluoroether solvents, low-volatility nonfluorinated organic solvents, diol solvents, and mixtures thereof. 3. The fabric article treating composition according to claim 2, wherein said lipophilic fluid is decamethylcyclopentasiloxane. 4. The fabric article treating composition according to claim 1, wherein said lipophilic fluid comprises from about 70% to about 99.99% by weight of the fabric article treating composition. 5. The fabric article treating composition according to claim 1, wherein said surfactant component comprises from about 0.001% to about 20% by weight of the fabric article treating composition. 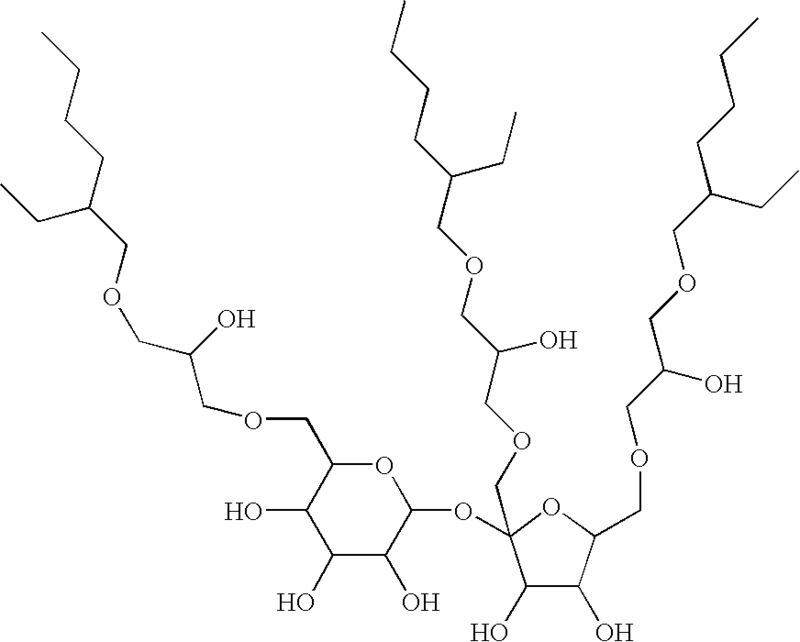 wherein R is derived from a linear, cyclic, branched, unsaturated feedstock based on hydrocarbon or silicone. 8. The fabric article treating composition according to claim 7, wherein R is an oleyl. 9. 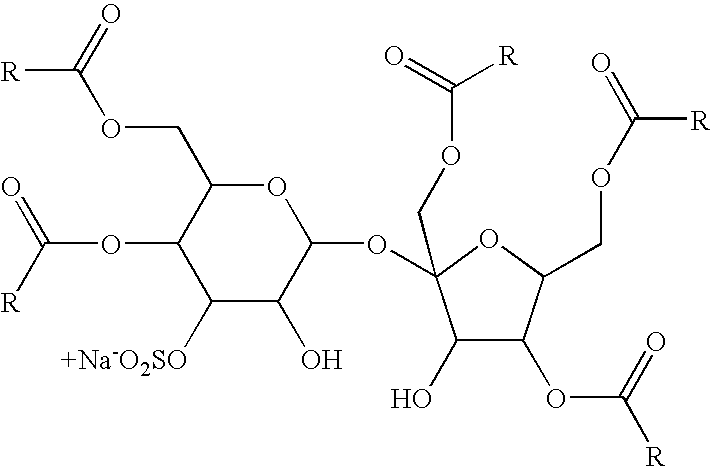 The fabric article treating composition according to claim 1, wherein said (b) surfactant component comprises a polyl-based surfactant chosen from saturated and unsaturated straight and branched chain linear aliphatic polyols; saturated and unsaturated cyclic aliphatic polyols, including heterocyclic aliphatic polyols; or mononuclear or polynuclear aromatic polyols, including heterocyclic aromatic polyols, monosaccharides, disaccharides, oligosaccharides, polysaccharides, sugar alcohols, sugar ethers, alkoxylated polyols, such as polyethoxy glycerol, pentaerythritol, amine containing polyols, and mixtures, thereof. 10. The fabric article treating composition according to claim 9, wherein said (b) surfactant component comprises a glycol. 11. The fabric article treating composition according to claim 10, wherein said glycol is glycerin. 12. The fabric article treating composition according to claim 9, wherein said (b) surfactant component comprises a monosaccharide. 13. The fabric article treating composition according to claim 9, wherein said (b) surfactant component comprises an oligosaccharide. 14. The fabric article treating composition according to claim 9, wherein said (b) surfactant component comprises a polysaccharide. 15. The fabric article treating composition according to claim 9, wherein said (b) surfactant component comprises a sugar alcohol. 16. The fabric article treating composition according to claim 1, wherein said non-silicone additive (c) comprises a nitrogen-containing organic material. 17. The fabric article treating composition according to claim 16, wherein said nitrogen-containing organic material is chosen from primary, secondary, tertiary amines, diamines, triamines, ethoxylated amines, amine oxides, amides, betaines, quaternary ammonium salts and mixtures thereof. 18. The fabric article treating composition according to claim 17, wherein said nitrogen-containing organic material comprises an alkyl amine. 19. The fabric article treating composition according to claim 18, wherein said nitrogen-containing organic material is chosen from: dodecylamine, stearylamine, oleylamine and mixtures thereof. 20. The fabric article treating composition according to claim 1, wherein said polar solvent comprises water. 21. The fabric article treating composition according to claim 1, wherein the optional second surfactant is a siloxane-based surfactant. 22. The fabric article treating composition according to claim 1, wherein said composition further comprises a cleaning adjunct chosen from: builders, additional surfactants, emulsifying agents, enzymes, bleach activators, bleach catalysts, bleach boosters, bleaches, alkalinity sources, antibacterial agent, colorants, perfume, lime soap dispersants, odor control agents, odor neutralizers, polymeric dye transfer inhibiting agents, crystal growth inhibitors, photobleaches, heavy metal ion sequestrants, anti-tarnishing agents, anti-microbial agents, anti-oxidants, anti-redeposition agents, soil release polymers, electrolytes, pH modifiers, thickeners, abrasives, divalent ions, metal ion salts, enzyme stabilizers, corrosion inhibitors, diamines, suds stabilizing polymers, solvents, process aids, fabric softening agents or actives, sizing agents, optical brighteners, hydrotropes and mixtures thereof. 24. The detergent composition according to claim 23, wherein said lipophilic fluid is chosen from siloxanes, other silicones, hydrocarbons, glycol ethers, glycerine derivatives such as glycerine ethers, perfluorinated amines, perfluorinated and hydrofluoroether solvents, low-volatility nonfluorinated organic solvents, diol solvents, and mixtures thereof. 25. The detergent composition according to claim 23, wherein said lipophilic fluid is decamethyl-cyclopentasiloxane. 26. The detergent composition according to claim 23, wherein said lipophilic fluid comprises from about 70% to about 99.99% by weight of the fabric article treating composition. 27. The detergent composition according to claim 23, wherein said surfactant component (a) comprises from about 1% to about 99% by weight of the detergent composition. 30. The detergent composition according to claim 29, wherein R is an oleyl. 31. The detergent composition according to claim 23, wherein said surfactant component comprises a polyl-based surfactant chosen from saturated and unsaturated straight and branched chain linear aliphatic polyols; saturated and unsaturated cyclic aliphatic polyols, including heterocyclic aliphatic polyols; or mononuclear or polynuclear aromatic polyols, including heterocyclic aromatic polyols, monosaccharides, disaccharides, oligosaccharides, polysaccharides, sugar alcohols, sugar ethers, alkoxylated polyols, such as polyethoxy glycerol, pentaerythritol, amine containing polyols, and mixtures, thereof. 32. The detergent composition according to claim 31, wherein said surfactant component comprises a glycol. 33. The detergent composition according to claim 32, wherein said glycol is glycerin. 34. The detergent composition according to claim 31, wherein said surfactant component comprises a monosaccharide. 35. The detergent composition according to claim 31, wherein said surfactant component comprises an oligosaccharide. 36. The detergent composition according to claim 31, wherein said surfactant component comprises a polysaccharide. 37. The detergent composition according to claim 31, wherein said surfactant component comprises a sugar alcohol. 38. The detergent composition according to claim 23, wherein said composition has a flash point of greater than 100° F.
39. The detergent composition according to claim 23, wherein said composition has a flash point of greater than 140° F.
40. The detergent composition according to claim 23, wherein all of said composition additives do not co-distill with the lipophilic fluid or are water soluble at the level used in the fabric article treating composition. 41. The detergent composition according to claim 23, wherein all of said composition additives have boiling points that are at least 20 C degrees above or below the lipophilic fluid. 42. The detergent composition according to claim 23, wherein said non-silicone additive comprises from about 1% to about 99% by weight of the detergent composition. 43. The detergent composition according to claim 23, wherein said non-silicone additive comprises a nitrogen-containing organic material. 44. The detergent composition according to claim 43, wherein said nitrogen-containing organic material is chosen from primary, secondary, tertiary amines, diamines, triamines, ethoxylated amines, amine oxides, amides, betaines, quaternary ammonium salts and mixtures thereof. 45. The detergent composition according to claim 44, wherein said nitrogen-containing organic material comprises an alkyl amine. 46. The detergent composition according to claim 45, wherein said nitrogen-containing organic material is chosen from: dodecylamine, stearylamine, oleylamine and mixtures thereof. 47. The detergent composition according to claim 23, wherein said polar solvent comprises water, which comprises from about 1% to about 90% by weight of the detergent composition.